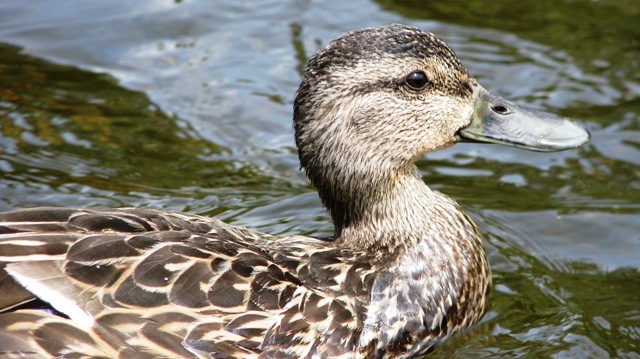 Our Wild Kingdom Weekend | You're telling me this ... why?? This weekend we gathered up a couple of canoes, a couple of kayaks, a grammie, an aunt, a mom and dad, a sister, a couple of cousins, and a partridge in a pear tree and we all headed to Riley Brook, NB for a day of paddling on the Tobique river. 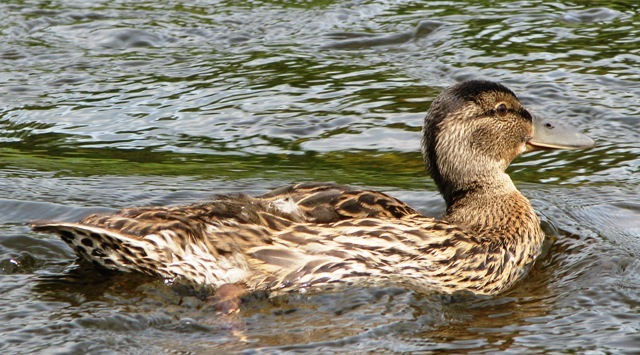 The river is a wide, slow river that is just perfect for a lazy float. It was beautiful as always and just rife with wildlife. Since I had my new camera in hand (thanks, hubby), I snapped a lot of pictures. I thought I would share them here for a change of pace… there must be a few animal lovers among us, aren’t there? 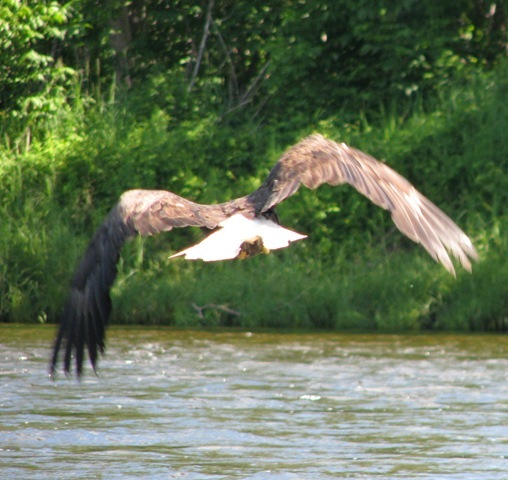 First up, this striking bald eagle for my American friends. 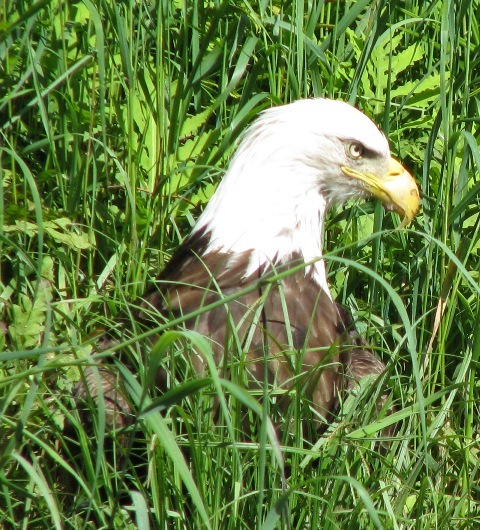 While you usually see eagles at the tops of the highest trees, this one was surprisingly sitting in the grass along the shore and just watching us float by. He was just begging for a picture so I paddled back and snuck around the corner to get the shot above… zoomed in, of course. They are big and a little scary-looking, aren’t they? I mean, look at those eyes! Suddenly, he started to stir and I thought, “My god, he thinks I’m a cat and is going to wrap those talons around my fully exposed neck”. I reached for my paddle but, as it turns out, he went flying in the opposite direction. In my attempt to defend myself, I probably missed the best flying shot but the one below isn’t bad. Check out that wing span! 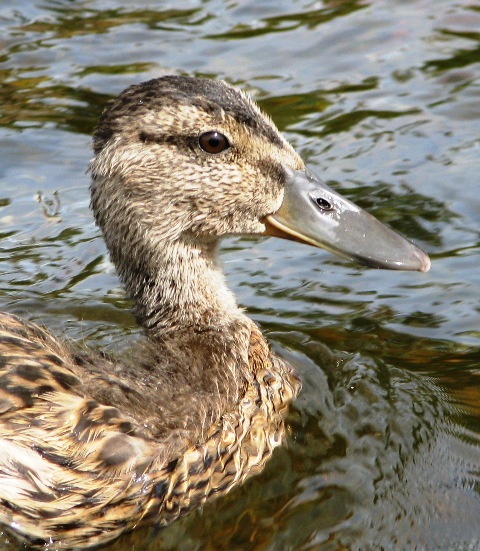 During the day, we saw several flocks of ducks… mamas with their little ducklings. Or maybe it was the fathers. I don’t know. I shouldn’t assume. There are more stay-at-home dads than there used to be and that is just fine by me. This one is a flock of Merganser ducks. All together now… Awwww! Aren’t they cute? I love there little tufts of unruly hair in the back. 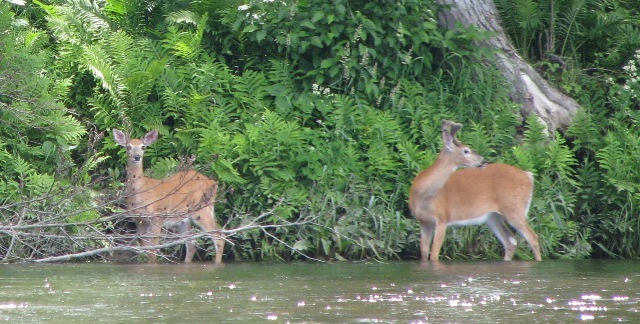 Next up is a couple of deer that were drinking along the water as we came around a bend in the river. They didn’t stick around for long but they also didn’t seem to worry too much about us. Deer sightings are pretty common for this remote area of NB. The wildlife highlight of the day… the hinterland who’s who moment, if you will… was another flock of lings. My mom, sister, 5-year-old cousin and I were lagging behind the rest of the boats. We had noticed a flock of ducklings quite a bit behind us on the water. 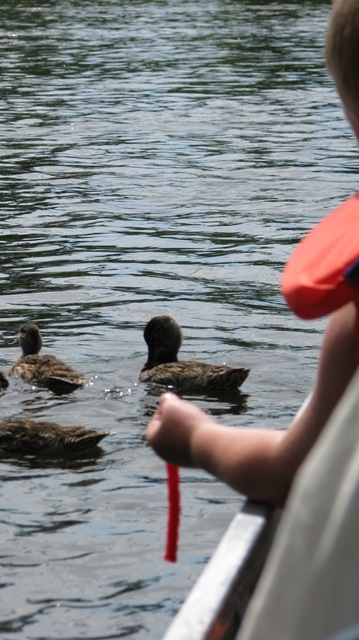 We joked, we laughed, and kept on floating, and then I heard something behind me… the ducklings caught up with us! They came right up beside the boat and, believe it or not, stuck right there beside us for a full five minutes. I snapped multiple pics… here are a few. It was a great end to our wildlife-a-rific day. My five-year-old cousin Matthew was particularly intrigued and wanting to feed them to keep them around. Not sure Twizzlers are the answer there, Matt, but I guess it’s worth a try.